Pocketburgers.com: Steve Jobs gave Barack Obama an iPad 2 "a little bit early"
Steve Jobs gave Barack Obama an iPad 2 "a little bit early"
It's no secret that the Obama administration tends to be a bit Apple-centric. During Obama's 2008 Presidential campaign, for example, Macs were relied upon quite a bit by his staff and folks in his administration were famously disappointed when, upon moving into the White House, they saw a plethora of outdated PCs running Windows. It's also no secret that Obama himself, though an avowed BlackBerry user, is also an iPad owner. During atownhall meeting back in March of this year, Obama admitted as much while joking with news anchor Jorge Ramos. But what we didn't know was that Obama got his iPad 2 a little bit before the rest of us, from Steve Jobs no less. So when might this transaction have gone down? Well, the iPad 2 was released on March 11, 2011. 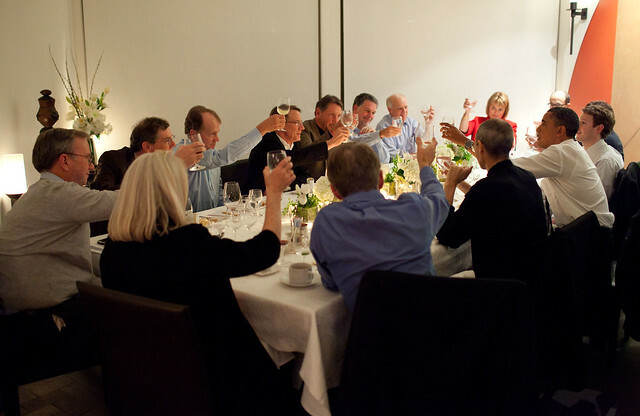 And interestingly enough, you might remember that Obama in mid-February hosted a tech-centric dinner where he invited a who's-who of tech luminaries, including Jobs, former Google CEO Eric Schmidt, Netflix CEO Reed Hastings, Larry Ellison, and Mark Zuckerberg. This all begs the question - how long as Obama been in possession of an iPhone 5? Below is the photo of the aforementioned White House dinner where Jobs can be seen sitting to Obama's left.